The cache is hidden near the wreckage of a JU-52 from WWII, on Ringebufjellet. The cache is improvised, an empty plastic coke bottle containing a single sheet of paper as a log book, a pen and a one-dollar bill. Walking to the cache should take 2-3 hours, depending on where you start from. If you're familiar with the area, the site is between Øverlihøgda and Gråhøgda. The cache itself is not in the main wreckage, but a few hundred meters to the southeast. It is an easy walk, in lovely, easy mountain terrain. nvecynar, cbffvoyl na ratvar pbjyvat be fbzrguvat fvzvyne. 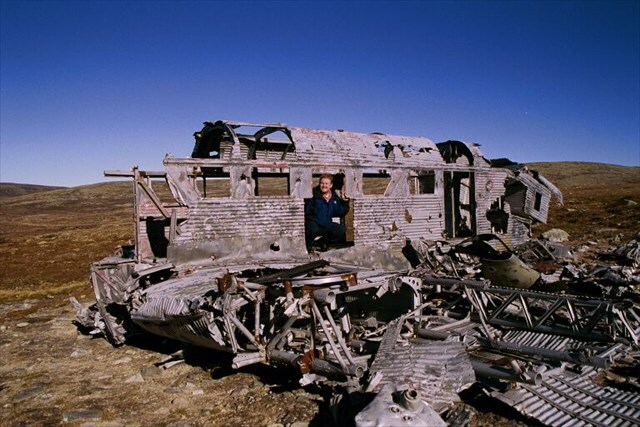 The JU52 wreckage, close to the cache.